Competition: Find the force with xbox’s new Kinect Star Wars app and win! Okay kids, its competition time and we have got some great prizes to give away from the techtastic folks over at xbox. In perfectly geeky way to celebrate the Jubilee and the launch of xbox’s Kinect Star Wars iPhone app, we’ve got a bevvy of goodies to give away to you our loyal readers. The prize pot for our competition includes; three of the official Star Wars xbox games and a £40 xbox Live gift voucher. You can get your mitts on the booty by telling us which Star Wars characters you can spot in the below video for the app. Our first randomly selected answer gets the xbox Live vouchers and the game and the two runners up get a game each too. You can send in your answers / questions to lauren@girlsngadgets.com and we’ll announce the winners next week – good luck and use the force well. 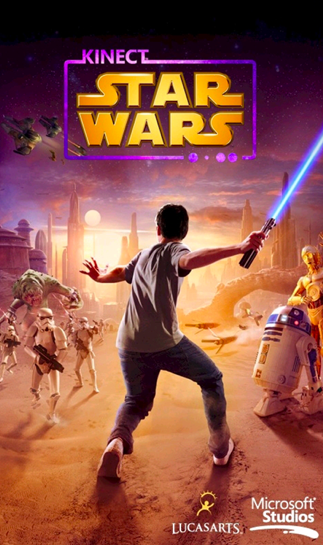 The Kinect Star Wars app comes to iOS, Android and Windows Phone (download links below). The app aggregates all your social goodness (Facebook and twitter feeds) into one stream with awesome Star Wars theme, including the iconic Star Wars opening sequence. It really is a neat little app and a nice way to get all your social updates in one feed, plus we love the Star Wars theme that makes it a fun alternative to the traditional Facebook and twitter apps. You will even get a few comical R2D2 and CP30 updates thrown into your feeds. You can download the iOS app here, the Windows phone one here and Android here. Let us know what you think.